iPhoneArt.com (IPA) is proud to announce the opening of the inaugural IPA Quarterly Gallery Exhibition. This group show features a diverse range of photographic based works from collage to street, landscape to portrait. Selected images will be showcased on the Mobile Arts Festival website (http://la-maf.com/ipa-quarterly-shortlist/) at IPA’s hometown gallery, the Santa Monica Art Studios (SMAS) Hangar Gallery South, from October 3 – November 9. The opening reception is Saturday, October 12, 6-9pm. Launched in partnership with ProCamera, all entries were submitted using the exhibition feature in latest version of the ProCamera mobile app. IPA’s international call garnered several thousand entries from over a dozen countries, brilliantly captured with smart phone devices and edited using mobile apps. Independent jurist for the IPA Quarterly was Hollywood filmmaker Mark Pellington. Selected works from the juried exhibition will be on display October 3 – November 9 at Hangar Gallery South in the Santa Monica Art Studios, 3026 Airport Ave, Santa Monica, CA. SMAS was the venue for the LA Mobile Arts Festival in 2012.
iPhoneArt.com (IPA) is an artist community and fine art print shop focused on mobile digital art creation and exhibition. We showcase and exhibit contemporary art and photography through our website, mobile apps, and select brick-and-mortar galleries. In 2012, iPhoneArt.com produced the LA Mobile Arts Festival, the largest exhibition of mobile art and mobile photography to date. 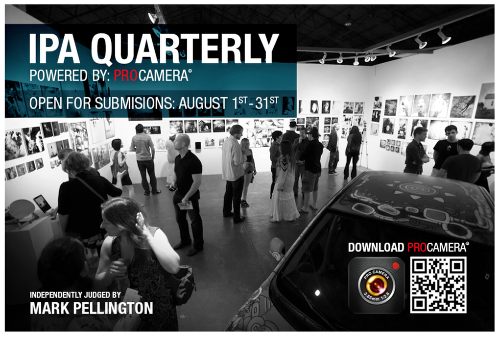 The IPA Quarterly exhibition marks the third partnership between IPA and ProCamera.